Salicylic acid peels are treatments used to deeply exfoliate the surface layers of the skin. Salicylic acid breaks the bonds that hold the skin's cells together, causing them to shed away or peel. As the skin regenerates, it is rejuvenated. Compared to other types of chemical peels, salicylic acid gives a gentle exfoliating action. Superficial salicylic acid peels can be done at home, with over-the-counter products. Stronger salicylic acid peels that penetrate more deeply are performed at the salon or the dermatologist's office. Many skin types can benefit from salicylic acid peels. And, because they are fairly gentle peels, salicylic acid can be used by people who aren't good candidates for other types of peels. Immediately following a salicylic acid peel, you'll notice your skin feels softer and smoother. Salicylic acid peels can brighten your complexion. They also will give your skin a better texture and make large pores look smaller. Salicylic acid peels are particularly helpful for treating acne and blackheads. Salicylic acid is a strong comedolytic, which means it helps unclog pores. It also helps decreases the amount of oil on the skin. Regular salicylic acid peels can help improve both inflammatory acne and comedonal acne. Salicylic acid peels are also used as anti-aging peels. While they can't erase deep lines and wrinkles, they can soften fine lines and give your complexion a boost. It is especially good at treating sun damage too. A series of salicylic acid peel treatments can fade dark spots and discolorations like melasma, freckles, and post-inflammatory hyperpigmentation (the discoloration that is left behind after a pimple heals). Superficial at-home salicylic acid peel products are available over-the-counter at cosmetic stores, salons, and other stores that sell skin care products. At-home peels work on the very surface of the skin. Regular use can give you smoother, softer, brighter skin, improve mild breakouts, and fade minor imperfections. Despite the name, at-home salicylic acid peels won't actually cause your skin to peel, rather they allow dead skin cells to slough away more quickly. At-home peels can contain up to 20 percent salicylic acid. Products come in many forms, from creams and gels to liquid solutions and pads. Read the instructions for your at-home peel product and follow them exactly. Not all brands work the same. Some salicylic acid products are meant to be left on overnight, while others should be washed off after just a few minutes. You may feel a tingling or very minor warming sensation during your at-home peel. Uncomfortable stinging or burning is not normal during an at-home peel, so if you feel that you should rinse the peel off right away with plenty of water and a gentle cleanser. Where most people get into trouble is leaving the peel on for longer than recommended, or doing them too often. This won't get you better results but can irritate your skin. Also, some prescription medications, especially those for acne or anti-aging like topical retinoids and isotretinoin, already cause rapid exfoliation of the skin. Pairing those with an OTC salicylic acid peel can irritate your skin. A good rule of thumb: if you're under a doctor's care, get the doctor's consent before using an at-home peel. For stronger salicylic acid peels, you'll have to see the pros. Superficial to medium-depth peels can be done by an esthetician in a salon or skin spa setting. Dermatologists can do stronger salicylic acid peels that work on deeper layers of the skin. 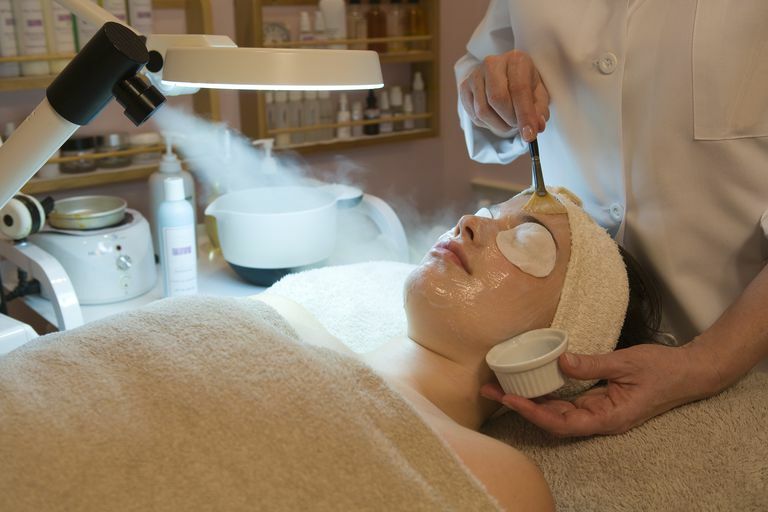 Professional peels range from 30 percent to 50 percent salicylic acid. Peels done in the dermatologist's office also are lower in pH than those done at the salon, making them even more powerful. A professional salicylic acid peel is a fairly quick procedure when done in your dermatologist's office. At the salon, it's often done as an add-on to a facial treatment. First, your skin will be thoroughly cleansed. A peel preparation solution, similar to an astringent, be applied to your skin with cotton balls or pads. A bit of petroleum jelly may be applied to your lips and around your nostrils to help protect these extra sensitive areas. Next, the salicylic acid solution is applied to the skin with cotton pads, large cotton swabs, or sponges. It only takes a few seconds to apply the peel solution. You'll get one to three applications of the solution, one on top of the other, depending on what the technician doing your peel feels is appropriate for you. More applications equals a stronger peel. The solution is left on your skin for about three to five minutes. During this time you'll probably feel some mild burning or stinging. Most describe the feeling as slightly uncomfortable but not painful. Some practitioners will use a small handheld fan to help cool your skin during the peel. After the time is up, the peel is neutralized with water or a special solution. Others self-neutralize after a certain length of time. Any remaining product is washed from your face with plain water or a gentle cleanser. A very mild moisturizer may also be applied. Having just one peel done will give your skin a bright, healthy glow and leave it feeling softer and smoother. To treat other skin issues, you'll need a series of peels done. This may mean three to 10 peels over the course of several weeks to months. But this will vary widely depending on your budget, time commitment, and desired results. Immediately after the peel your skin will likely be red and may look tight and shiny. The hot or stinging sensation can last for a few hours after the peel, but it's mild and feels similar to a sunburn. Depending on how strong of a peel was done, you may get flaking and peeling skin anywhere from two to four days post-treatment. Peeling will be minor and resolves in about a week. During the first few days post-peel, treat your skin gently. Wash with mild cleansers. Use gentle moisturizers to help with dryness or flaking. Whatever peel you use, whether pro or DIY, it's imperative you follow up using a sunscreen every day. Your newly peeled skin will be more sensitive to the sun, so you don't want to risk sunburn. Besides, daily SPF use is a healthy habit anyway. Chemical peels, in general, are very safe procedures. The deeper the peel, the higher the chance of developing side effects. So, you'll be more likely to see side effects after a deep salicylic acid peel than you will from a superficial salon peel. Still, even strong salicylic acid peels generally won't cause side effects substantial enough to keep you from your daily activities. Salon peels should not be done if you are currently using isotretinoin and, in many states, estheticians are restricted from doing them until you have been off of isotretinoin for 6 months. Dermatologists have no such restrictions and can do them whenever they deem safe for your skin. Salicylic acid peels are incredibly safe for most skin types. You have plenty of options, too. At-home peels are the least expensive of the bunch, but they aren't as powerful as professional peels you can get at your salon or dermatologist's office. A series of peels will garner you the best results. As always, if you're under a doctor's care, make sure you get their blessing before starting any type of salicylic acid peel treatment, professional or otherwise. Arif T. "Salicylic Acid as a Peeling Agent: A Comprehensive Review. "Clinical, Cosmetic and Investigational Dermatology. 2015 Aug 26;8:455-61. Kligman DE, Draelos ZD. "Combination Superficial Peels With Salicylic Acid and Post-Peel Retinoids." Journal of Drugs in Dermatology. 2016 Apr;15(4):442-50. Mohamed Ali BM, Gheida SF, El Mahdy NA, Sadek SN. "Evaluation of Salicylic Acid Peeling in Comparison with Topical Tretinoin in the Treatment of Postinflammatory Hyperpigmentation. "Journal of Cosmetic Dermatology. 2017 Mar;16(1):52-60.